This makes a great alternative to a Sunday roast, or would be perfect for friends coming round for dinner as the pork can be cooked well in advance. 1. Seal the pork belly in a large ovenproof pan with a little oil until evenly golden to dark brown. Transfer to a plate and set aside. 2. Add all the vegetables, herbs and spices to the pan and sweat, until just starting to caramelise. Add the soy sauce and reduce by half. Pour in the white wine and reduce by half again. 3. Return the pork belly back into the pan and cover it with the stocks. Cover all of it with a cartouche, a round piece of baking parchment the size of the pan to keep in the moisture. 4. Braise in the oven for approximately 2 hours at the temperature of 100°C, gas mark ½ . Remove the belly and press it between two baking trays with a weight on top. Place it for around 2 hours into the fridge. 6. To serve, slice the pork belly to the desired thickness. Heat a little oil in a pan. When hot, add the sliced pork and seal, add the sauce and heat thoroughly. 7. 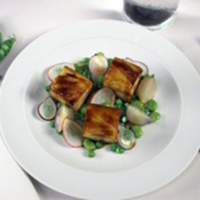 Serve the warm broad beans, peas, and radishes in a little bit of stock and butter then arrange the pork on top. Garnish with the asparagus and thinly sliced raw radish.